Donald Justice, 1041 E Burlington St Wilbur Schramm, 540 S Summit St and 1110 E Court St Jack Leggett, 415 S Summit St John Irving, 1130 E Court St Philip Roth, East end of Grant St Ray B. West, Jr, 839 Kirkwood Ave The Places then.... Burkley Hotel, 9E Washington Street, house the Maid Rite Cafe in the front, and the Greyhound Bus Depot in the rear. 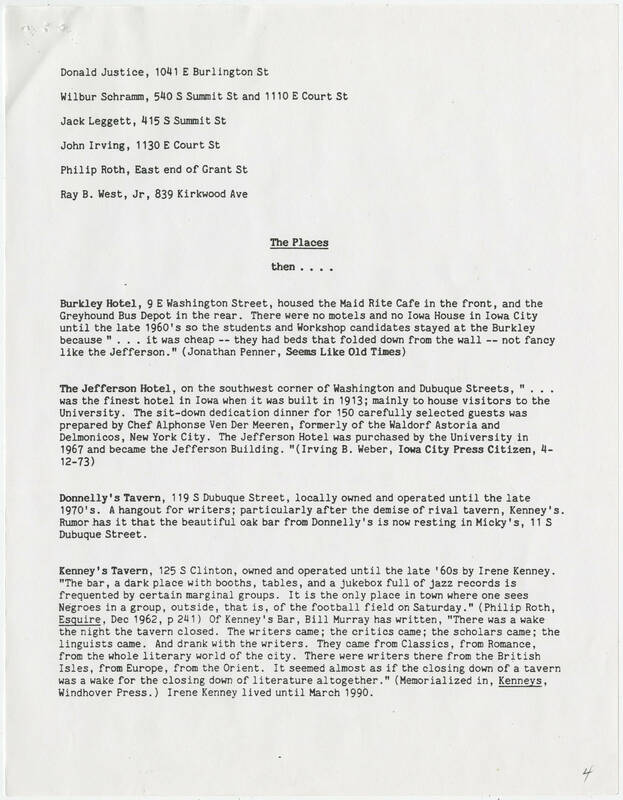 The were no motels and no Iowa House in Iowa City until the late 1960's so the students and Workshop candidates stayed at the Burkley because "...it was cheap -- they had beds that folded down from the wall -- not fancy like the Jefferson." (Jonathan Penner, Seems Like Old Times) The Jefferson Hotel, on the southwest corner of Washington and Dubuque Streets, "...was the finest hotel in Iowa when it was built in 1913; mainly to house visitors to the University. The sit-down dedication dinner for 150 carefully selected guests was prepared by Chef Alphonse Ven Der Meeren, formerly of the Waldorf Astoria and Delmonicos, New York City. The Jefferson Hotel was purchased by the University in 1967 and became the Jefferson Building." (Irving B. Weber, Iowa City Press Citizen, 4-12-73) Donnelly's Tavern, 119 S Dubuque Street, locally owned and operated until the late 1970's. A hangout for writers; particularly after the demise of rival tavern, Kenney's. Rumor has it that the beautiful oak bar from Donnelly's is now resting in Micky's 11S Dubuque Street. Kenney' Tavern, 125 S Clinton, owned and operated until the alte '60s by Irene Kenney. "The bar, a dark place with booths, tables, and a jukebox full of jazz records is frequented by certain marginal groups. It is the only place in town where one sees Negroes in a group, outside, that is, of the football field on Saturday." (Philip Roth, Esquire, Dec 1962, p241) Of Kenney's Bar, Bill Murray has written, "There was a wake the night the tavern closed. The writers came; the critics came; the scholars came; the linguists came. And drank with the writers. They came from Classics, from Romance, from the whole literary world of the city. There were writers there from the British Isles, from Europe, from the Orient. It seemed almost as if the closing down of a tavern was a wake for the closing down of literature altogether." (Memorialized in, Kenneys, Windhover Press.) Irene Kenney lived until March 1990.